This article is about the raid battle. For the summon stone, see Proto Bahamut. For the SSR summon stone, see Bahamut. In response to an earnest plea, the dragon breaks its shackles. Its cry resonates across the sky, and strikes awe into the hearts of all who hear it. Proto Bahamut is one of two Rank 80 raids. It is summoned from the northern Zinkenstill area, Azure Sky Sanctum. This raid is a primary source of Horn of Bahamut and Rusted Weapons, both used to craft Bahamut Weapons. You can summon Proto Bahamut at rank 80 and join at Rank 50. In order to summon Proto Bahamut, you must combine one True Anima of each element to create a Star Sand Scoop at the shop. You might also need to complete the Omega showdowns of Luminiera and Celeste to trigger its appearance. Small Dark attack to all allies. Inflicts 2 random status effects. Random element multi-hit attack to all allies. inflicts damage per turn based on the number of players in the raid. More players gives less damage. Random element multi-hit damage to all allies. 999,999 Dark damage to all allies. Casts Skyfall. Dispels all debuffs on self. Double Attack Rate is heavily increased. Drop table last updated: 2017-04-27, all stated drop rates are estimates. Holy Sabers are highly recommended to deal with Bahamut's Skyfall. It is also highly recommended to bring a form of debuff removal. Turn on Foe HP under Menu > Settings > Gameplay Settings > Display Foes' HP. Watch for when its HP is near 25% and 5% to prepare your mitigations. "Veil" is an unofficial name used by the wiki for this status effect. Its actual in-game name is "Immune. ", or removed with Clarity. He can also recast it. Check Proto Bahamut's buffs before using any high-damage moves (like a full Charge Attack chain or a bunch of nukes) to minimize the chance of wasting the attack on a Elemental Resist Up effect from Abdak Force. near the 25% trigger as it can cause the raid to waste all of their defensive skills then die when the effect ends and Proto Bahamut casts the trigger. The 5% trigger is safer to use Paralysis on as he only has 12 million HP left. The most common way to reach 100% damage mitigation is by using Phalanx II/III and using a summon or party ability to cover the last 30%. Chaining off of any Carbuncle will always give 25% damage cut, which is insufficient. Skyfall will still deal 5% (49,999) damage, which will kill most characters. Warning! Does not work for Plain Damage! in a blaze of glory and reflect Skyfall's damage back at Proto Bahamut. Disclaimer: Leeching this raid is deeply disrespectful. If you don't have time to contribute please don't join. Small Random element multi-hit attack to all allies. Proto Bahamut unleashes fiery power!Proto Bahamut moves to Fire phase. ~5000 Fire damage to all allies. Small Fire damage to all allies. Proto Bahamut unleashes aquatic power!Proto Bahamut moves to Water phase. ~4000 Water damage to all allies. Takes 25% more damage on each ally. ~250 Plain damage per turn, ATK/DEF/DA/TA Down, spreads on skill use. Proto Bahamut unleashes earthen power!Proto Bahamut moves to Earth phase. Small Earth damage to all allies. Chance to inflict Petrify on all allies. ~20,000 Earth damage to one ally. ~40,000 Earth damage to one ally. Proto Bahamut unleashes aerial power!Proto Bahamut moves to Wind phase. All allies' HP values are set to 1. ~10 hits of 1000 Wind damage to random allies. Removes all buffs on all allies. Proto Bahamut breaks its bonds!Proto Bahamut moves to Dark phase. Verification needed. , and a random 80% elemental resistance. 80 hits of 500 random element damage to random allies. 4-hit Plain damage to random allies based on 55% of max HP. Proto Bahamut unleashes its true power!Proto Bahamut moves to Final phase. Plain damage to all allies based on 95% of max HP. 80 hits of 1250 random element damage to random allies. 9,999,999 Dark damage to all allies. Base charge diamonds change to ◇◇◇◇◇. Drop table last updated: 2018-11-11, all stated drop rates are estimates. Minimum honor for full Prestige Pendant contribution is around 500,000 honor. The recommended party composition for Bahamut HL is 2 Hawkeyes with Break Keep, 4 Holy Sabers (with at least 2 of them equipped with Double Trouble III), 4 Bishops (with at least 2 of them equipped with Clarity), 1 non-Dark Dark Fencer and 2 Superstars with Angelic Voice II. All extra slots should be focused on debuffers (Apsaras (with Axe as mainhand), DFs with Quick Down, Superstars) or extra defensive classes. Holy Saber is generally a safe choice. The minimum recommended PWR is 51,000 for Light and 57,000 for all other elements before Cosmos Weapon stat inflation. You can get away with a little bit less if you are confident in what you're doing. Proto Bahamut can have a DPS check when below 50% health if the raid composition has poor Holy Saber coordination. Bring at least two to four mitigation-based summons - preferably two 3★ Darkbuncles or one 3★ Darkbuncle and Athena (Summon). If you have wiped or lost your MC, message the raid to make it known. Coordination in this fight is important as each member has a role to play. Not dying before 5% can be critical to beating the raid. Zahlhamelina's Flare and Izmir (Summer)'s Blizzard are also banned. 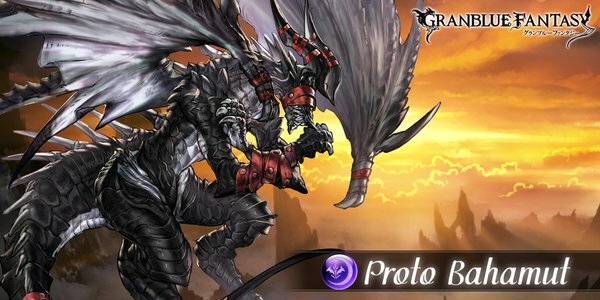 Proto Bahamut has very high attack and Flare/Blizzard can let him oneshot Light users, even with their Dark resistance. Sachiko's Full Spark is similarly prohibited. can and should be applied the entire fight. Use the "Clarity please!" chat comment (in the Heal category) when you need a clear. Use in-game stickers when Phalanx or Panacea is used, to minimize wasted skill uses. In order to stop overlapping Phalanxes, use the following method when preparing a Phalanx use. First, Use the "Casting a Shield" comment. Afterwards, cast Phalanx and use the Phalanx sticker. If anyone uses the "Casting a Shield" comment before you as you're preparing your shield, save it. Gravity is no longer prohibited and should be used as much as possible. Extend Break is recommended to be used from here onwards, as much as possible. However, characters with weaker Extend Breaks such as Sarunan should still not use their EB skills unless absolutely necessary. Users with PetrifiedStops enemy's charge diamonds from filling. Recommended times to apply Fear after the Wind Phase are at OD 50%－25% and N 25%－0%. Hyper Dimension OD has a 1/4 chance of instantly killing your MC. Do not take unnecessary risks. can also be used for additional risk management. Paralysis is now unbanned. Recommended times to use it are if the boss is in OD between 50% and 25% health and at all times below 25% health. Phalanx is to be cast on cooldown when the boss is below 25%. Proto Bahamut can do normal attacks for upwards of 10,000. This page was last modified on 8 July 2017, at 02:26.